Winter in Canada is fraught with legend, myth, humor – and truth. All across the Great White North, driver’s concede each fall and swap over their all seasons for beefier, more adaptable tires suited for winter snow and ice. All season tires are not a good option for all weather conditions. They are not optimized for winter driving conditions, and shouldn’t be interpreted as such. A good set of winter tires can have a stopping effect on ice and snow of as much as 30-40% difference, stopping in a much shorter distance than their all-season counterparts. When speed directly translates into the force of a crash, being able to stop safely in snow and ice can become a matter of life and death. In this post, we’ll discuss the differences between winter and all season tires, as well as their benefits and the science that goes into creating a good winter tire. Further, we’ll divulge some helpful winter driving tips for those who don’t yet have winter tires. You’ll feel armed with the knowledge to ask about these details during your next routine maintenance with your vehicle service department. While mainstream consumers often look at the design and tread pattern of their tire choices for confirmation of their worth and stopping power, the most important aspect of a winter tire is the rubber compound that it’s constructed of. Treads are designed to divert water and snow away from the central tire channel, giving traction as you drive, but the rubber compound is the portion of the tire that’s designed to remain soft in freezing conditions. In contrast, summer, or all season tires harden when the temperatures drop, resulting in a slick, ineffective surface that reduces traction – think of sliding a glass of water across a marble counter top The hard surfaces offer no traction, and the glass effortlessly slides. In this regard, all season tires simply can’t match – or even come close – to the stopping power of winter tires. The science of winter tire design considers a long list of important scientific factors, including the ability of the tire to recover from deformation when taking a turn, tread stability and durability, as well as its ability to dissipate heat. It’s not so much the amount of snow your area has accumulated that should be the tipping point for putting on your winter tires, or purchasing new ones; it’s the temperature outside. As a general rule, you should try to be prepared to have your tires switched when temperatures regularly fall below 7C. Watch the weather forecast and make an educated guess as to when the best time will be – unless you happen to live in the province of Quebec, where you’re legally obligated to have winter tires on your car from December 15th – March 15th. Many times in the retail consumer world, a knock-off version or discounted product will perform very similarly to that of the name brand, or premium product – not the case with winter tires. 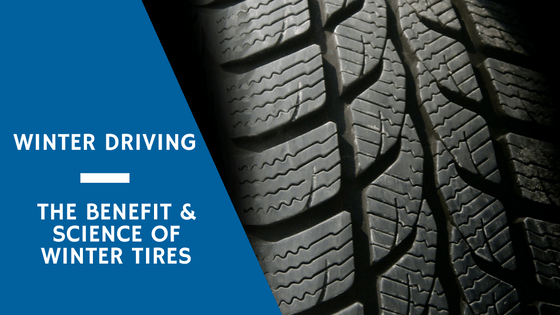 A more expensive tire generally means you’re paying for updated rubber technology and tread pattern design. Different tires perform differently in different environments, so taking the advice of your trusted vehicle service department can help you to make an informed decision for where you live. If you’re driving in deep snow 80% of the time in a rural setting, having a tread design that features thick, blocky tread blocks – the part of the tire that bite into ice and snow – is the better option. On the other hand, if you’re driving predominantly in slushy urban traffic, a tire with deeper and more pronounced sipes – the grooves that help to displace water and slush from under the tire – this may be the better option for your driving environment. A better, more expensive rubber compound means more tread contact with the road, translating into better traction. A cheaper tire means a cheaper compound, and possibly a less durable tire that will need to be replace in a few seasons. Winter tires should also be slightly narrower than your regular summer tires. The reduction in width by an average of one size increases the pressure the tire will exert on the road beneath the tire. This will particularly benefit a driver who sees lots of deep snow, resulting in a reduction in hydroplaning and the tire’s ability to slice through snow. If you’re considering buying used winter tires, take a careful look at the wear bars to assess how much life the tires have left in them. By looking down the top of the tire, the wear bars are the raised sections located inside the tread that run from side to side. If the wear bars are even with the treads, continue your search. Ignoring the massive safety implications and benefits of winter tires could spell disaster for your new paint job, or your health. The bonuses of having these crucial tools for safe and effective winter driving not only help to keep you safe, but others on the road as well. A good set of winter tires will give you the confidence to tackle Canadian winters with ease, provided you respect the conditions and drive within your comfort level. If you’re having difficulty narrowing down your choices, consider speaking with one of our certified mechanics or sales staff, who can help you to make sense of the different tread patterns, brands, and sizes for a perfect fit that helps you get to where you’re going.